Did your team make Scottish football's play-offs? Celtic and Morton are celebrating winning the Scottish Premiership and Scottish League One respectively, while Hearts and Albion Rovers had already wrapped up their title success in their respective Scottish Championship and Scottish League Two divisions. In a thrilling day of football across the country, here is a list of what was decided and what is still up for grabs in the Premiership and the play-offs. Celtic won the league on Saturday with three games to go, having trounced Dundee the night before, as Aberdeen failed to beat Dundee United at Tannadice. Aberdeen have secured at least second spot, but third place and a guarantee of qualifying games for the Europa League has yet to be decided. Inverness Caledonian Thistle, St Johnstone and Dundee United can all still clinch that spot, with John Hughes' third-placed team in the strongest position. They have 56 points from 34 matches, four points ahead of United and the Perth Saints, the latter having played one game more. Two games that could prove pivotal will be the two matches outstanding between Inverness and Dundee United, both of which will be in the Highlands. At the bottom, St Mirren's 3-0 defeat away to Partick Thistle means they are eight points adrift of second-bottom Motherwell with three games to go. That win for Thistle guaranteed their Premiership safety. The Steelmen look like they will be dragged into the Premiership play-offs against the team to emerge from the play-off matches between Hibernian, Rangers and Queen of the South in the Championship. They are six points behind ninth-placed Kilmarnock, who lost 3-2 to Hamilton on Saturday, and 10th-placed Ross County, who are just behind Killie on goal difference. Motherwell and the Staggies drew 1-1 at Fir park on Saturday. Hearts ended their season on a high with two late Genero Zeefuik goals pinning Rangers back in a 2-2 draw. That result had no bearing on the final league placings because Hibernian's 3-0 win at Falkirk meant they finished second and consigned Rangers to a two-legged quarter-final against fourth-place Queen of the South. Hibernian will play the winner of that quarter-final to enter the two-legged Premiership play-off final against the team finishing 11th in the Premiership for a place in the top tier next season. Alloa beat Cowdenbeath 3-0 on the final day to send the Fifers down to League One but the Wasps will have to endure the Championship play-offs because Livingston's 1-0 win over Queen of the South meant they finished above them on goal difference. 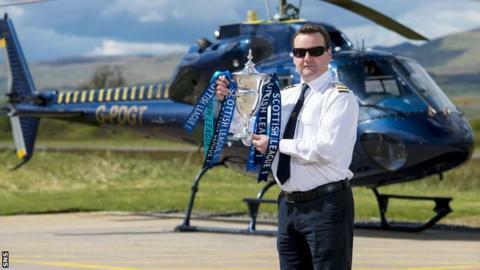 The helicopter headed for Greenock after Morton's win over Peterhead coincided with Forfar's defeat at home to Ayr United. Stranraer clinched second spot with a win at Brechin. So, Morton are promoted to the Championship, while fourth-placed Brechin take on Alloa, who finished ninth in the Championship in the play-off semi-final. Stranraer and Forfar will contest the other semi-final, with second-place Stranraer enjoying home advantage in the second leg. At the bottom, Stirling were already relegated but finished their season with a 3-2 win over Stenhousemuir, who finished second bottom and now play East Fife, who finished fourth in League Two. Ayr avoided the play-offs. Albion Rovers have won the league and are promoted to League One as champions. There was no movement in positions two to four on the final day. Queen's Park finished second and take on Arbroath in a two-legged League One play-off semi-final. East Fife play Stenhousemuir in the other semi. At the bottom, eighth-placed Berwick Rangers and second-bottom East Stirlingshire lost heavily on the final day but only Montrose are threatened with relegation. Under Scottish football's pyramid system, they will play Brora Rangers in the Scottish League Two play-off final. After two 1-1 draws, the Highland League winners beat Lowland League champions Edinburgh City 4-2 on penalties in their semi-final. Montrose, should they lose the play-off final, would drop into the Highland League.